Alison's garden design principles inspired me to link my garden and home. A good place to start was my entrance. Your entrance must provide a good impression. It is the most important part of your home. That is where you welcome your guests and it is a window to your personality. First impressions last. I matched flower color, planters and scatter cushions to brighten up my home entrance. The theme was carried into the interior of my house as well. Since I have redone my entrance, my neighbors have been inspired and have also made their gardens pretty. Our street will soon be the prettiest in town! Dissappointed with this picture. Looks more like a home then a garden. 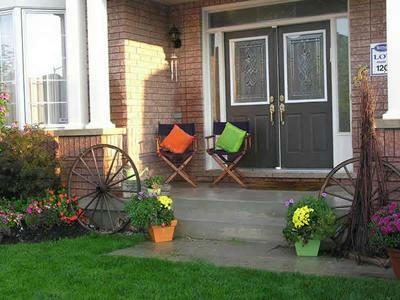 More emphasis should have been on the flowers and less on front door and chair cushions?? ?